Regulation of the Speed of the Engine — The governor and the fly wheel together regulate the speed of an engine. Variations in speed which extend over a considerable number of revolutions due either to a change in the load or to the steam pressure are taken care of by the governor. Variations that occur during the period of one or two revolutions of the engine are taken care of by the fly-wheel. The object of the governor is to keep the speed of the engine as nearly constant as possible independent of variations in the steam pressure or of the load. No governor so far made can keep the speed exactly uniform because they are themselves driven by the engine and the engine must change its speed first before the governor can act. In the best stationary engines the variation in the speed of the engine does not exceed two per cent. In traction engines the variation is somewhat greater, although even they are governed very closely, for a good governor acts almost instantly and prevents anything beyond a small variation in the speed. All governors regulate the speed of the engine by proportioning the total pressure which drives the piston throughout the stroke to the work it has to do. This is accomplished in one of two ways. 1. By throttling; that is, changing the pressure of the steam before it reaches the cylinder, the cut-off remaining at a constant fixed point. 2. By varying the point of cut-off in the cylinder, the pressure remaining constant up to the point of cut-off. These two principles of governing give rise to two distinct types of governors known as throttling governors and variable expansion governors. The throttling governor is placed on the main steam pipe near the steam chest and regulates the steam pressure in the steam chest by making the opening through which the steam must pass either large or small, depending upon the load the engine is pulling. If the load is heavy the opening is large and steam flows into the steam chest at practically boiler pressure, but if the load is light the opening is reduced until only a small quantity of steam can pass into the steam chest and consequently what does get in expands to fill the space and its pressure falls. In the case of a very light load this pressure may be only a small fraction of the boiler pressure. In this way the governor regulates the total average force acting upon the piston without affecting the point of cut-off. All traction engines so far made are equipped with throttle governors. The variable expansion governor acts either upon the eccentric or upon the valve and causes cut-off to occur earlier or later, depending upon whether the load is light or heavy. It does not affect the pressure of the steam admitted to the cylinder. The initial steam pressure is therefore constant and practically the same as boiler pressure. After cut-off the pressure of the steam falls rapidly and consequently the average pressure throughout the stroke may be regulated by the point of cut-off, being low if cut-off is early and high if it is late. Variable expansion governors are said to be somewhat more economical in the use of steam than throttle governors, but they are not easily adapted to reversible engines and so up to the present time have been used only on fairly large sized stationary engines. The principle of action of almost all governors of either type depends upon the change in centrifugal force when the speed of rotation changes. If any body is made to rotate rapidly about a center every part of that body has a tendency to get further away from the axis. The force, which causes this tendency is called centrifugal force and is due to the rotation of the body. The faster the rotation the greater the force. For example, with the same weight of rotating body, doubling the speed increases the centrifugal force fourfold. n order to get a clear idea of the action of a governor, we will first consider the oldest and simplest form of throttle governor made, namely, the pendulum governor, an illustration of which appears in Figure 54. The construction of this governor is very simple and can readily be understood from the figure. 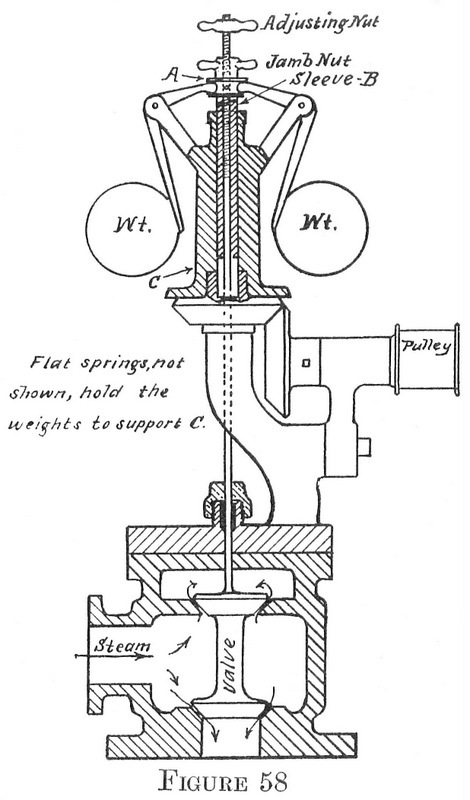 The pulley at the bottom, driven by a belt from the engine, causes the spindle and balls to rotate, whereupon the balls move upward and outward, elevating the sliding sleeve S and operating the bell crank lever B, which in turn regulates the opening and closing of the valve through which steam passes to the engine. With a governor of this type, having certain given dimensions and a certain weight for the balls, it follows that a certain speed of rotation must be attained before the centrifugal force is sufficient to overcome the weight of the balls and cause the governor to act. When this speed is reached the governor begins to act as a governor. 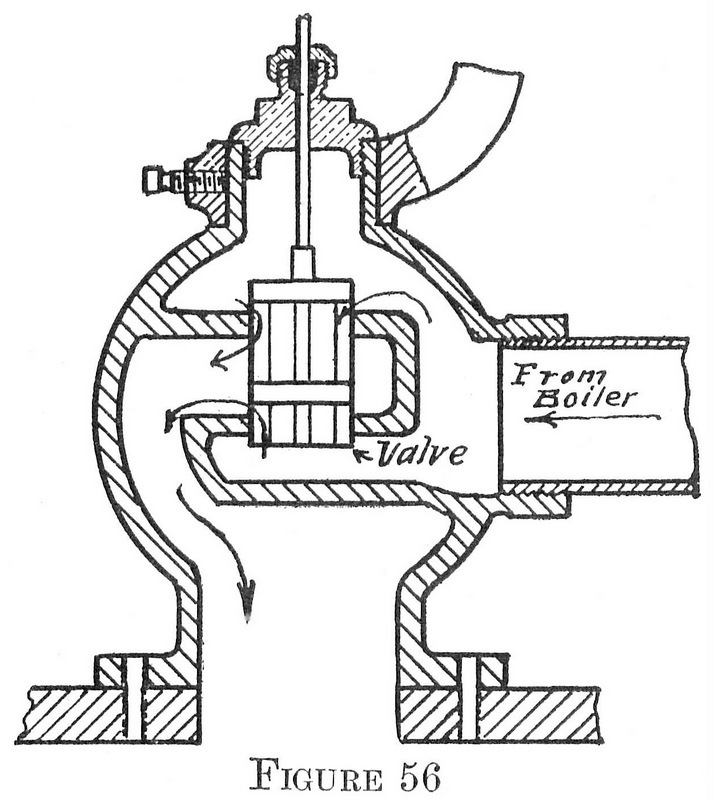 If, when the speed increases, the sleeve, S, reaches the highest point and in doing so does not close the valve which supplies steam to the engine, then the speed may go on increasing indefinitely, but the governor is no longer acting as a governor. It performs the functions of a governor only within the range of speed which belongs to it while moving from its bottom to its top position. 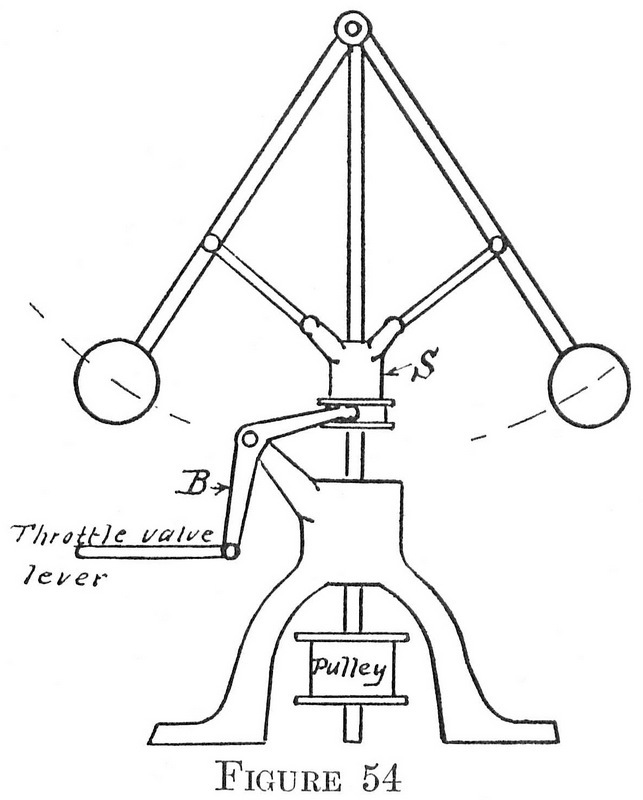 A simple pendulum governor, like the one illustrated, will work fairly well at slow speeds, but when run at a high speed the movement of the sleeve, S, is very little for a wide variation in speed and so the movement of the throttle valve is insufficient to control the steam supply. Figure 55 shows a better form of governor and one adapted to fairly high speeds. The balls are light and the spindle is supplied with a weight. This weight resists the centrifugal action of the balls and tends to bring them back quickly to their original position. 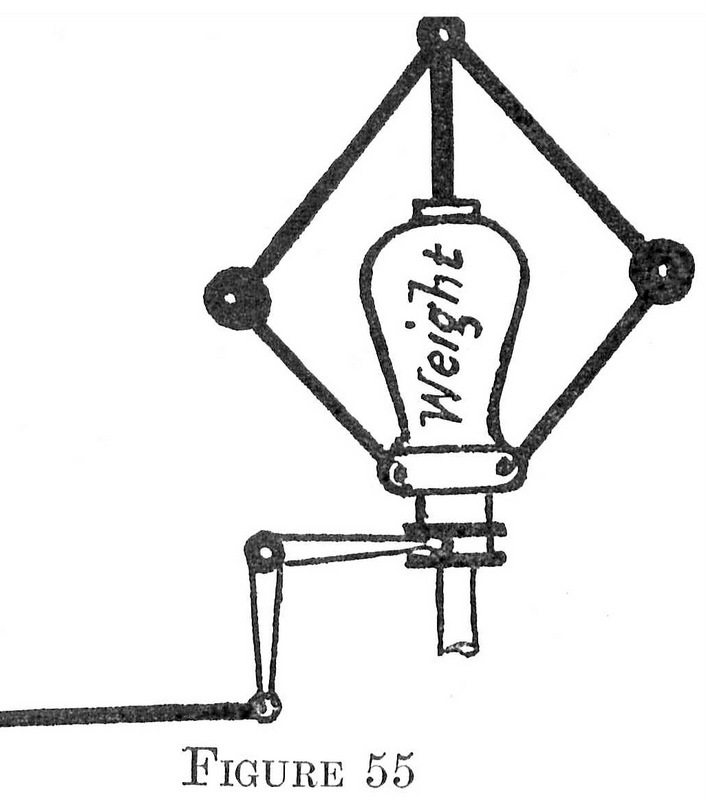 The vertical distance traveled by the weight and sleeve is just twice that traveled by the balls. The balls are made light and revolve at a high rate of speed in order to develop enough centrifugal force to lift the weight. Since the range of movement of the sleeve is considerable, being twice that of the balls, it makes this governor effective at higher speeds than the pendulum governor. A governor is said to be stable when the balls always assume a given position with a certain speed of rotation, and unstable when they assume any position indifferently throughout their range for a given speed of rotation. The condition for stability is that the centrifugal force must increase more rapidly than the radius or distance of the balls from the axis. This will be referred to again in discussing other forms of throttle governors. Modern governors, instead of having a dead weight for a load, are provided with some sort of a spring load which performs the same office in a better and more satisfactory way. Before taking up this phase of the subject, however, we will proceed to discuss the governing effect of the fly-wheel. The turning force at the crank is not constant. At the beginning of the stroke when the engine is on center it is nothing. From this point until the crank and connecting rod make a right angle with each other it increases, and then decreases again to zero at the other dead center. When the engine is pulling a constant load the force exerted at the rim of the band wheel is always the same. We have therefore an intermittent force acting upon a constant load, and the requirements are that the speed of rotation must be practically uniform when the crank receives its greatest push and give it up again when the crank is passing center. This is the function of the fly-wheel. The heavy rim of the fly wheel situated at a considerable distance from the center of the shaft effectually resists the sudden push of the crank for an instant, but in doing so it absorbs the energy of this push and gives it back to the engine when the crank passes center. If the size and weight of the rim is nicely calculated there will be scarcely any change in speed during a rotation of the wheel. On the other hand, without either a fly-wheel or a crank disc, an engine would not be able to make a complete revolution, but would stop on the first center. Gas engine fly wheels are made very heavy at the rim in order to absorb enough energy to carry them several revolutions at a uniform speed when they receive no explosion. A fly-wheel does not add any to the power of an engine whether it be large or small, it simply tends towards more uniform motion. Modern Governors — The variable expansion governor used largely on stationary engines is generally, though not always, placed on the main shaft and acts directly on the eccentric. One style shifts the eccentric straight across the shaft just like the shifting eccentric reverse gear, explained on a previous page, only it does not shift the eccentric far enough to reverse the engine. The other style of shaft governor rotates the eccentric around the shaft. Both styles of governors act just the same as hooking up the reverse lever, thus changing the point of cut-off. It can readily be seen that a governor of this kind would be hard to adapt to a traction engine, which is already equipped with some device to reverse the engine, some of which change the position of the eccentric. This leaves the throttle governor as the only available governor so far for the traction engine. The style in universal use is what is known as the spring loaded type. The balls are made light and the governor is run at a high rate of speed, usually from about 400 to 450 revolutions per minute. When the balls fly out under the actions of centrifugal force, they are obliged to overcome the action of a strong spring, which tends to hold them in a position of rest. These springs are so constructed that it takes more centrifugal force to overcome their resistance the farther the balls move outwards. In other words the resistance of the springs increases faster than the centrifugal force does; thus making them stable governors; that is, governors which always assume the same position for a given rate of speed. The result of this arrangement is to prevent any sudden variation of the pressure of the steam in the cylinder and to maintain the speed of the engine practically constant. Figure 56 is a sectional view of the body of a well-known throttle governor. The body is made of iron and the valve and valve seat of brass. Steam flows into the bottom part of the body both from the upper and the lower sides of the valve. In this way the valve is balanced, that is, it receives, as much pressure on the top as on the bottom and all the centrifugal force of the balls has to overcome is the weight of the valve and the tension of the springs which hold them back. The method of regulating the speed of the engine by means of a governor is accomplished in a variety of ways depending upon the style of the governor. Diagrams illustrating these speed-regulating devices are shown in Figures 57 and 58. In Figure 57 the valve is held open when the governor is at rest by means of the fork acting on the collar at A. This fork is actuated by means of a long spiral spring whose tension can be made greater or less by means of a thumb nut on the end, thus putting either a light or a heavy load on the valve to hold it up and open. The lower head is stationary while the upper one is free to move downward. The distance the valve is raised from its seat by the fork, A, is regulated by the adjusting nuts. If they are screwed away down on the valve stem the valve will be lifted high and it will require a wide movement of the balls, and consequently a high speed, to bring the surface, C, of the nut, N, low enough to close the valve. It will also be perfectly clear that if the adjusting nuts were screwed up near the top of the valve stem that the valve would be forced lower and the port opening would be less, consequently when the balls move out the supply of steam will immediately be throttled and the speed of the engine reduced. When the nuts are screwed clear down, the port opening may be so wide that considerable movement of the valve will be necessary before the steam supply is throttled and the speed of the engine reduced. It will also be clear on a little consideration that the adjusting nuts could be screwed clear down or left out entirely and the adjustment made by means of a thumb nut, S, which could be raised or lowered so as to strike the end of the valve stem when the engine attained any desired speed. Another scheme of regulating the speed is sometimes adopted. In this plan the valve stem is either shortened or lengthened by some device situated between the fork, A, and the nut, N. The effect of this device is to either raise the valve from its seat or lower it, depending upon whether the valve stem is shortened or lengthened. All of these schemes are made use of in the governors applied to traction engines and they are very effective when it is desired to run the engine at a considerably different speed. They must, of course, be used in connection with the speeder spring connected with the fork, A, that puts a load on the valve. This load must be adjusted to correspond to the change in speed, for if the speeder spring were under too great tension the centrifugal force developed by the balls at a reduced speed might not be sufficient to overcome its resistance. 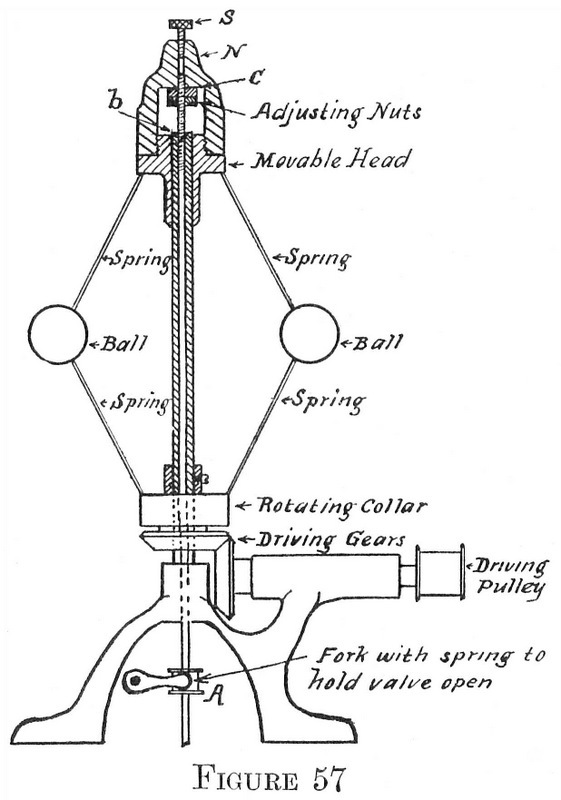 The speeder spring itself, as the name implies, can be used to change the speed of the engine within certain limits by making a greater speed of the balls necessary in order to develop enough centrifugal force to overcome its tension. Another scheme for regulating the speed is shown in Figure 58. In this type of governor the valve stem is threaded through the sleeve B, and is provided with a thumb-nut at the top with which it may be raised or lowered. A jamb nut below locks the valve stem to the sleeve. A collar at A, fastened to the sleeve, is actuated by the balls, which, when they move outward under the action of centrifugal force, push both the sleeve and valve stem down and tend to seat the valve. When the adjusting nut is screwed up, it lifts the valve farther away from its seat and consequently the balls must move out farther in order to seat the valve. This can only come about by rotating them at a higher rate of speed, but since they receive their motion from the engine, the latter must also run faster before the governor will begin to govern. If the adjusting nut is screwed down, the valve is brought nearer to its seat and hence when the balls begin to move the valve immediately begins to cut off the supply of steam and reduce the speed of the engine. If the speed of the engine is reduced much below normal with this type of governor the steam passages are so much restricted that the engine, while it may govern very nicely, will be supplied with steam at such low pressure that it will not have very much power. Under these conditions, it is better to make the change in speed by changing either the pulley on the governor or the one on the engine shaft so that the governor will run at its normal speed. Governors of this type are not provided with a speeder spring, but heavy curved springs are attached to the balls and to the rotating head, C, which resist centrifugal force and tend to bring the balls back to a state of rest. As before stated, the speed of the engine may be changed by changing the sizes of the pulleys in such a way that the governor will still rotate at its normal speed even though the speed of the engine be greatly changed. In many cases, and especially where close governing is required at a low speed and the maximum power of the engine is required, this is the best way. To Find the Diameter of the Governor Shaft Pulley — Multiply the diameter in inches, of the engine shaft pulley, by the desired number of revolutions of the engine per minute and divide the product by the speed stamped upon the governor; the quotient will be the diameter of the governor pulley needed. To Find the Diameter of the Engine Shaft Pulley — Multiply the number of revolutions stamped on the governor by the diameter of the governor pulley and divide the product by the speed at which the engine is to run; the quotient will be the required diameter of the engine shaft pulley. Most throttle governors are equipped with what is called a Sawyer’s lever, that is, a lever on the side having a forked arm which engages with a collar on the valve stem. Wires are run from the ends of this lever to the engineer’s platform, which enable the engineer to open or close the governor valve forcibly regardless of how the governor may be adjusted, and thus control the speed of the engine by hand. A large number of governors are also provided with what is called a safety stop. This is so arranged that if the governor belt breaks, the stop causes the governor valve to fall and shut off steam from the engine. In one make of governor a heavy pulley attached to an arm rests on top of the governor belt. When the belt breaks this arm falls and in doing so engages the valve stem and forces the valve to its seat. Another arrangement disengages the bevel driving gears and allows the whole head of the governor to fall and shut off the steam.